2. Problem definition and establishing requirements. 2.1 Design process. 2.2 Defining objectives. 2.3 Quantifying requirements. 2.4 Production cycle. 2.5 Production modeling. 2.6 type of systems. 2.7 System carrying capacity. 2.8 Carrying capacity guidelines. 2.9 Design requirements. 2.10 Constraints. 3. Site considerations. 3.1 Marine conditions. 3.2 Terrestrial conditions. 3.3 Permitting. 3.4 Site selection. 4. Seawater sources. 4.1 Options and considerations. 4.2 Artificial seawater. 4.3 Seawater wells. 4.4 Marine intakes. 5. System planviews and elevations. 5.1 Generic system. 5.2 Elevations and head tanks. 5.3 Intake and pump house considerations. 5.4 Discharge considerations. 6. Piping design and calculations. 6.1 Major trade-offs. 6.2 Biofouling control. 6.3 Water hammer. 6.4 Frictional losses in pipes. 6.5 Frictional losses in fittings. 6.6 Open channel flow. 6.7 Momentum in pipes. 7. Pump Selection. 7.1 Pump options. 7.2 Generic centrifugal pump. 7.3 NPSH and dynamic head. 7.4 Matching system and pump. 8. Materials selection. 8.1 biological constraints. 8.2 Seawater constraints. 8.3 Piping materials. 8.4 Pump materials. 8.5 Marine concrete. 8.6 Problem areas. 9. Seawater flow control. 9.1 Gravity flow. 9.2 Water level control. 9.3 Control of flow rate. 9.4 Flow measurement. 10. Suspended solids removal. 10.1 Considerations, trade-offs and options. 10.2 Cartridge filters. 10.3 Diatomaceous earth filters. 10.4 Filter bags. 10.5 Centrifuges and cyclones. 10.6 Sand filters. 10.7 Microscreens. 10.8 Sedimentation. 11. Heating and cooling. 11.1 Setting requirements. 11.2 Heat exchangers. 11.3 Problem areas. 12. Aeration and degassing. 12.1 Aeration system requirements. 12.2 Gravity aerators. 12.3 Submerged aerators. 12.4 Gas supersaturation and degassing. 12.5 Removal of other gases. 13. Disinfection. 13.1 Considerations and options. 13.2 Chemical compounds. 13.3 Ozone. 13.4 Ultraviolet (UV) radiation. 14. Alarms, monitoring and automatic control system. 14.1 Characteristics and options. 14.2 Alarm points. 14.3 Automatic control. 15. Water recycling. 15.1 Setting requirements and options. 15.2 Nitrification and biofilters. 15.3 Foam fractionation. 15.4 Activated carbon and ion exchange. 15.5 Algae. 16. Wet laboratory areas. 16.1 General considerations and trade-offs. 16.2 Indoor areas. 16.3 Outdoor areas. 17. Construction considerations. 17.1 Construction arrangements. 17.2 Construction cost estimating. 17.3 Design changes. 17.4 Installation of seawater lines. 17.5 Start-up. 18. Operational considerations. 18.1 Operating procedures. 18.2 Assignment of responsibilities. 18.3 Spares and redundancy. 18.4 Preventive maintenance. 18.5 Monitoring and control. 18.6 Operational problem areas. 19. Putting it all together. 20. Summary commandments. References. Appendices. Subject Index. This book provides, in one place, basic information and considerations necessary to plan, build and operate seawater systems for culturing purposes. It provides design, construction and operations guidance for seawater (salinities from freshwater to brine) systems with flow rates of 10-1,000 gallons (40-4,000 liters) per minute. While the book concentrates on general circumstances, situations and concepts, comprehensive referencing of text and annotated bibliographies are provided in critical technical areas to allow readers to pursue specialized areas of interest. 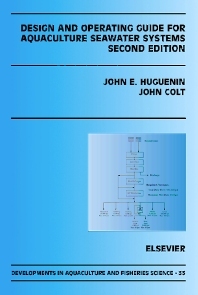 This upgraded and expanded Second Edition contains a considerably increased number of numerical examples relative to the first edition to demonstrate practical applications of the concepts and presented data.